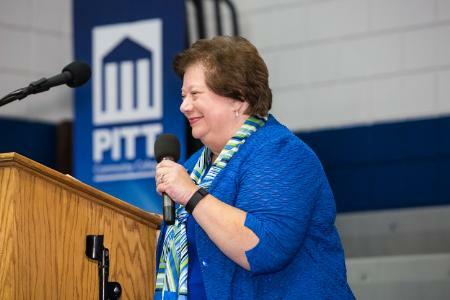 More than 500 Pitt Community College employees met for convocation August 15, 2017 to look back upon the previous academic year and prepare the one that began two days later with the start of fall classes. Held in the Charles Coburn Center, the program featured remarks from President G. Dennis Massey and other college administrators, along with videos on student success and a relatively new system for alerting campus police of emergencies via office computers and special call buttons. A pair of representatives from the League for Innovation in the Community College  Cynthia Wilson and Marcia Pfeiffer  also spoke about their organization's "Faculty Voices Project," which produced valuable insight on progress, obstacles and concerns associated with student success. Convocation was also an opportunity for PCC Vice President of Institutional Advancement Susan Nobles to let faculty and staff know about a new capital campaign to raise money for construction of the Eddie and Jo Allison Smith Center for Student Advancement on campus. She said Phase I of the facility would consist of 34,000-square-feet of space for classrooms, conference rooms, a student scholarship office, and the college's Women's Resources Center and Veterans Affairs program. The center, which will be located at the corner of Warren Drive and Reedy Branch Road near Minges-Overton Baseball Complex, will also house the PCC Institutional Advancement Division, which includes the PCC Foundation, Marketing and Media Relations departments, and the VISIONS Career Development and Scholarship Program. Nobles said Phase I would cost a minimum of $8.5 million, and she noted that the PCC Foundation is well on its way toward reaching its capital campaign goal of $10 million. In addition to paying for construction of the center, she said funding raised through the campaign would allow the foundation to build its endowment for scholarship and general funds. "… We have received confirmation for the lead facility naming gift of $2 million from Eddie and Jo Allison Smith and their family," Nobles said. "The Smith Family has been very generous to PCC and to Pitt County residents. We are so appreciative of their efforts to help us lead this important campaign." Nobles said PCC Trustees and the State Board of Community Colleges have also given their approval for the college to use $4 million of its Connect NC bond funding North Carolina voters approved in 2016.